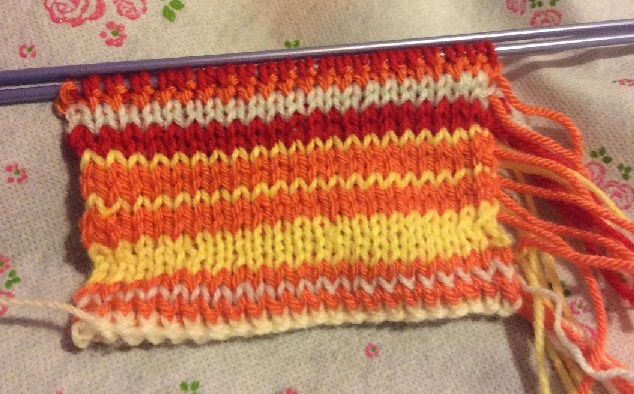 I started my temperature scarf on 1st March. Autumn proper doesn't really start until late March here, and it feels strange knitting in 30-degree heat! I didn't want to wait any longer to start though. Here is the rainbow of colours I chose. They are all from my stash. Perhaps some of the colours don't quite match exactly, but I'm quite proud of myself not having to purchase any yarn at all. As you can see, the variable but mainly hot days of late Summer are visualised in warm-toned colours beautifully (if I do say so myself! ), and I'm very pleased with it so far. I'm using the tube knitting technique, and planning to pull the ends through to the centre with a crochet hook instead of having to weave them in. I hope it works out! I'm glad you like it! I'm planning to do an update once a month. Because the weather is so variable here, it should be interesting.